"A depiction of the last twelve hours in the life of Jesus of Nazareth, on the day of his crucifixion in Jerusalem." If you think that Easter is all about bunnies and chocolate eggs then it's probably time for you to watch Mel Gibson's historical epic. Of course, really the bunnies and eggs thing belongs to the pagan Spring celebration of "Ēostre" not to the Roman Catholicism which replaced it (and the Jewish Passover) with its own religious tomfoolery, giving up things for lent, and stupid names for Tuesdays and Wednesdays which I have no idea about. I always thought "Ash Wednesday" was something to do with cigarettes and I still don't know what a "shrove" is. But, anyway, "The Passion of the Christ" is an almost flawless and extremely brutal retelling of Jesus' last moments which is made even more special by having the actors speak in either Aramaic, Hebrew or Latin according to the race of their characters. It's all very clever stuff both graphically and linguistically. The only things which I didn't really like were the appearances of Satan (played by a woman for some reason) which I'm sure weren't in any of the gospels which I've read. I may be wrong about that though as it's been many years since I last read a Bible. Jim Caviezel was a pretty good Jesus, not quite as good as Robert Powell in "Jesus of Nazareth" (1977), but there's only so far a very Western looking actor can take the part. I always picture Jesus as a lot more Mediterranean looking and, since I'm not a huge fan of Christian movies, I have no idea if it's a rule that all portrayals of Jesus must conform to the pictures you see in Italian churches. 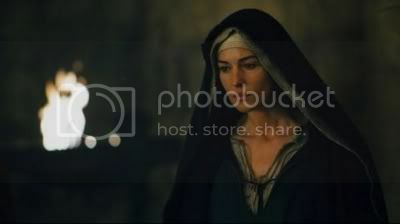 Another big plus for "The Passion of the Christ" was having Monica Bellucci in it as "Magdalen" although once again cast against ethnic type. I'll watch Monica Bellucci in just about anything. 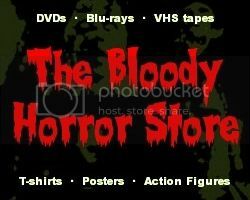 For those of you who think that I'm kidding around by praising this movie on a horror blog, just wait until you see the merciless torture which Jesus goes through here. The Romans were renowned for their cruelty and nothing has been held back in the scourging or crucifixion scenes. You can almost feel the pain! My nephew summed it up best when he said, "If you really did something like that to somebody, they would die!" Yeah, that's kind of the point. Even if you don't believe any of the story (which would be stupid because it's all true in spite of having no historical evidence to support any of it), if you've never seen "The Passion of the Christ", you've missed out on one of the best horror movies in the last ten years.